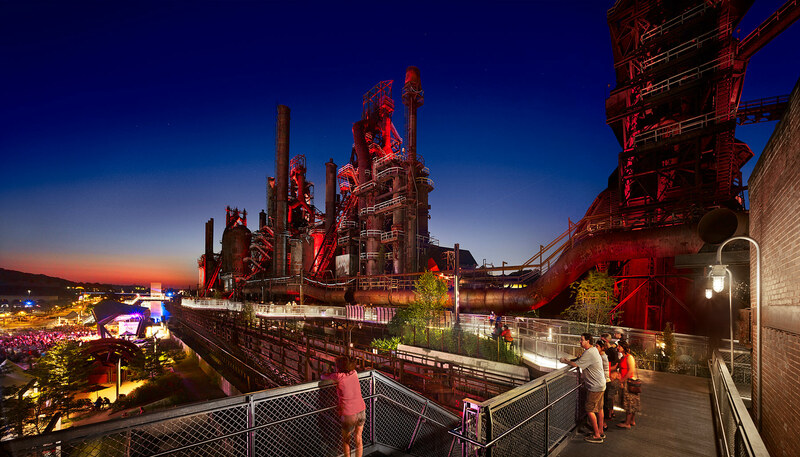 The SteelStacks campus turns the former Bethlehem Steel Plant into a dynamic arts and cultural campus with a community center. Highlighting the history of the area, L’Observatoire International worked within the 10-acre core of the site to create multiple performance venues, plazas, and parks. The campus is crowned by the Hoover-Mason Trestle, a walkway rehabilitated from a former elevated railway, and features Levitt Pavilion, an angular open-air stage with monumental blast furnaces as a backdrop. The thoughtful attention to detail and theatrical approach to lighting—which illuminates the structure from within and behind to better highlight its volumes—emphasizes the drama of Bethlehem’s industrial heritage. Sosolimited conceived a dynamic, nature-inspired architectural lighting system that brings the Cedar Kettner Garage to life. Beyond responding to actual lighting conditions in real time, the lighting system includes a user-friendly interface that allows staff to easily change the animations for holidays and events. Charged with transforming a 1907 landmark bank building into a theater with a new lighting structure, Cline Bettridge Bernstein Lighting Design sought to turn the facade into its own marquis. The versatility and precision of the lighting fixture illuminates its architectural details while lending the theater a lustrous presence. Tonight, the City of Boston is getting lit. The city is opening up City Hall Plaza, the front lawn of Boston's best-known (and most-hated) Brutalist building, to food trucks, carnival style–games, and beer-swilling citizens to celebrate its latest attempt to gussy up Government Center. Attendees at Light Bright Beer Garden, this year's last Beer Garden on the Bricks, will witness a colorful light display on the angular concrete massing so deliberately stripped of ornamentation. 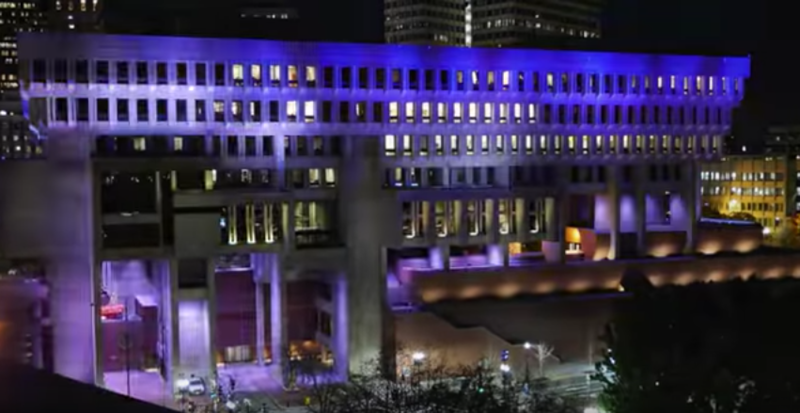 The official promotion video below gives a hint of the light display in action: If early online comments on the event are any indication, bright primary-school colors might not be enough to make jaded Bostonians love architecture firm Kallmann McKinnell & Wood's difficult creation. YouTube user Shaun Beacham writes: "We're sorry the building looks like a prison, but we put some lights on it and now it's a colorful prison!" A few pints in, Shaun, and it might not look so bad! The event begins at 6:30 p.m. tonight at City Hall Plaza. Can't make it? Follow #LightBrightBOS on Twitter, Facebook, and Instagram. 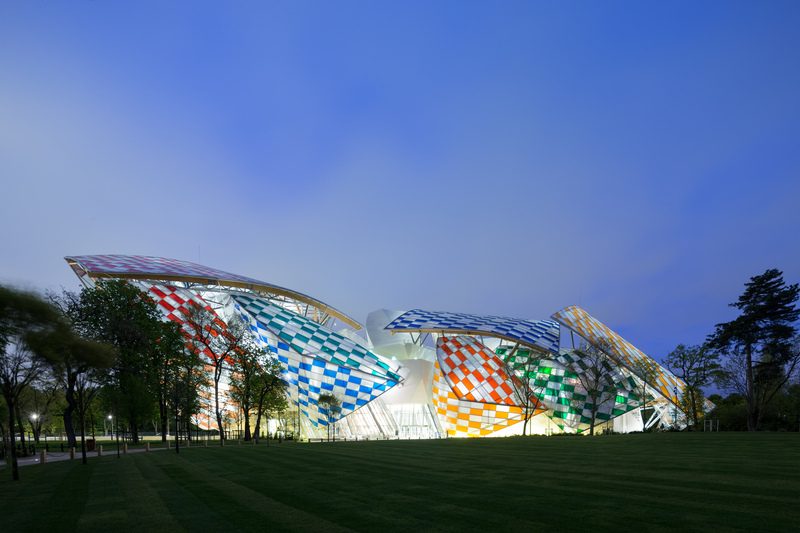 Starting on May 11 this year, Frank Gehry's Fondation Louis Vuitton building in Paris is set to host a dazzling glass installation by French conceptual artist, Daniel Buren. Titled L’Observatoire de la lumière (or Observatory of Light) the installation will see some 3,600 tiles of glass alongside a series of colored filters, broken up at regular intervals by alternating vertical white and blank stripes. The articulation of light and interplay of color spans across the building's twelve classic Gehry-style volumes, known as "sails," working in sync with the Gehry's design which, until now, employed a colorless paneled facade. Making use of thirteen different colors, arranged to create the illusion of forms disappearing at different times during the day, light entering the building through these filters will enhance the interior spaces, changing their spatial qualities. Bernard Arnault, President of the Fondation Louis Vuitton said “Daniel Buren has designed a grandiose project, pertinent and enchanting, the result of a real dialogue with Frank Gehry and his building.” "The transparency and quality of a colour projected by means of a coloured filter, as I see it, make it much more alive than painted colour covering a surface” said Buren in a Press Release. “There is a quantity of mirror effects here at the Fondation that actually don’t come from mirrors but from the windows. Almost everywhere something is reflected (...) through the coloring of the sails, all those reflections will become more and more present and will awake those sleeping mirrors that are everywhere. I think that this will enable visitors to further understand and enjoy the singularity of this architecture,” continued Buren. To commemorate the installation opening, a catalogue, designed in collaboration with Buren, will amalgamate works touching on color, transparency, light, translucency, and projection all created since the 1970s. Alongside L’Observatoire de la lumière, a theatrical piece will be shown from June 2 to 4. BurenCirque: 3 times another Hut revolves around three fairground inspired huts. Again using light as a key theme, the huts will become "translucent and mysterious lanterns at night." The piece was conceived in the early 2000's by Buren working with brothers Dan and Fabien Demuynck. Children visiting the Fondation Louis Vuitton will also be able to appreciate and engage in Buren's light spectacle. Aimed at children aged six to ten, The Light Trap lets the projections and reflections of color within the building form a giant kaleidoscope. A workshop will then allow the children to explore different opacities and discover how light can alter space perception. The Light Trap will run from May 28 to August 28, every Saturday and Sunday, from 2:30–5pm. The High Line in New York is spinning off art projects on all sides. 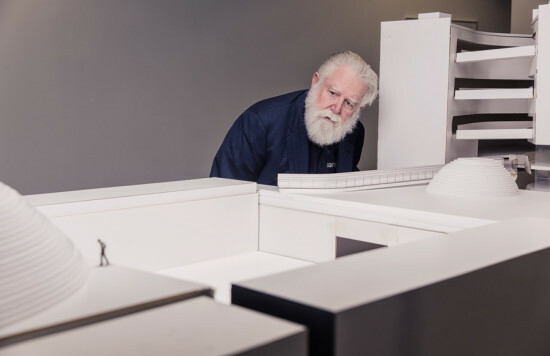 For those seeking an immersive architectural walk, tailored to the conditions of their surroundings, a non-discrete bridge in Chelsea may be the answer. https://vimeo.com/150895684 It may be only a small-scale intervention, but a public bridge running next to the High Line now houses a scintillating display of interior lighting. During the day and from an external perspective, the bridge appears mundane, dated even, and of no particular interest. Step inside however, and the bridge comes to life. 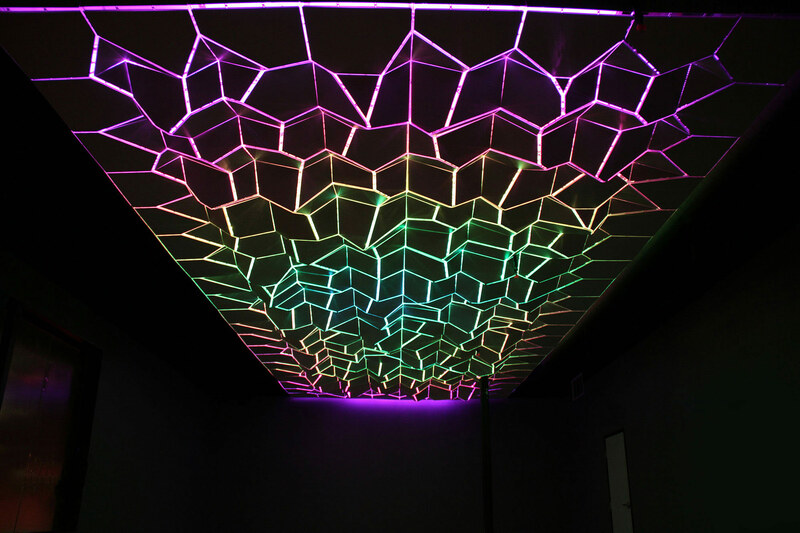 Taking responsive architecture to the extreme, the 70-by-10-foot installation called Prismatic_NYC utilizes 66 individual prisms, each individually powered by a brushless motor. Subsequently 40,000 integrated LED’s beam across the bridge in a wave-like form. Prismatic_NYC is the work of Hyphen-Labs working alongside IA Interior Architects installed an array of rotating light prisms within the structure. The light show isn’t static either. 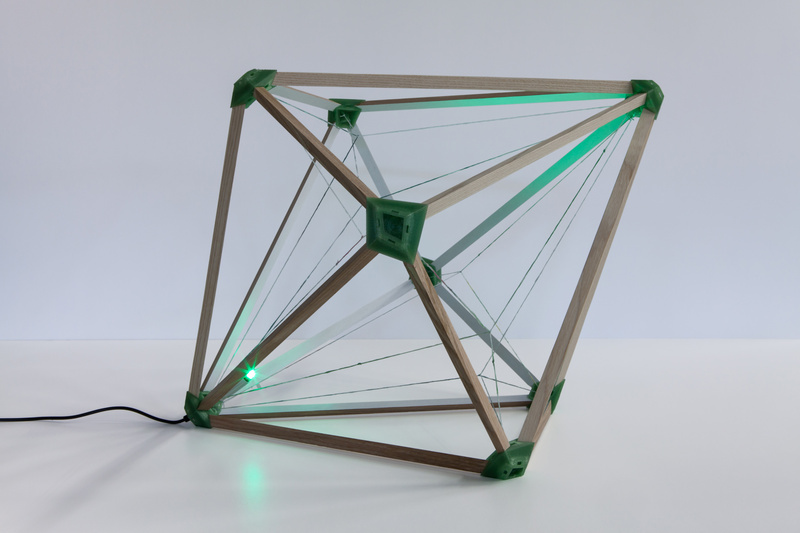 Using online weather sources, the display responds to changes in the local climate awarding each user a unique experience. A staggering amount data is accumulated to achieve this. Cloud cover, wind speed, humidity, and the accumulation or intensity of precipitation, frequency, speed, and position of the "light-wave," to name a few, go into the installation's lightscape. 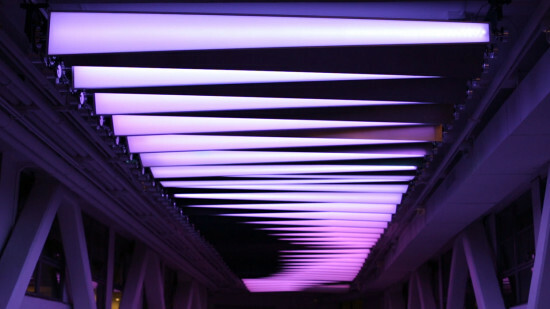 To amplify the experience further, the designers behind Prismatic_NYC stated that "temperature changes generate a noise function that develops the sculptures color and light behavior." And in order to be in tune with seasonal/holiday moods, a built-in calendar checks for seasons and holidays, sunrises and sunsets, tidal movements, and lunar and celestial events. In theory, no walk through the bridge should ever be the same on different occasions. As a result, the fully enclosed bridge hence connects travellers to the conditions outside while providing them with shelter. One can easily imagine hearing the rain from inside, or seeing the sun set and being exposed to the structures interpretations. "Prismatic allows us to meditate on the beauty of light, geometry, and waveforms. Each side distinguishable from the other as they absorb, reflect, and generate light," said Hyphen-Labs on its website. 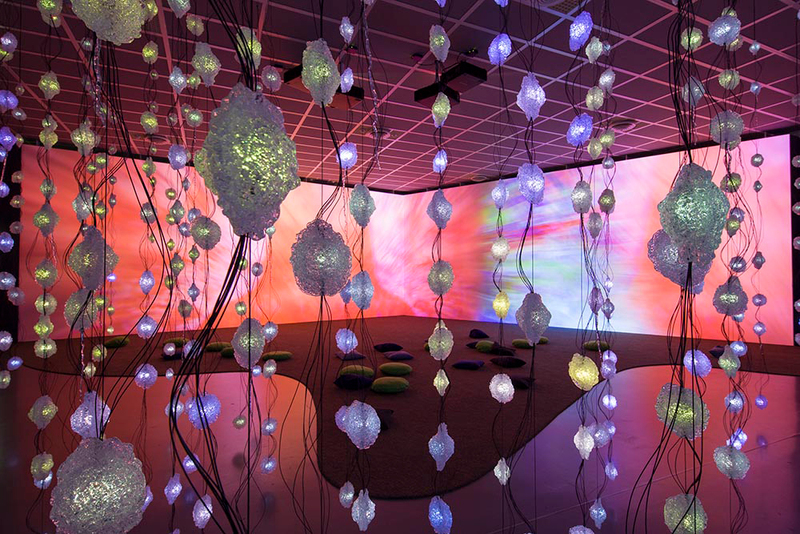 "Harmonious luminescent rotations broadcast oscillating waves that spread out through the space and constantly reflecting our changing environment." "The design of the tapered prisms went through various iterations. Generative and parametric design approaches ensured the optimization of the visual experience," the designers continued. "The prisms’ physical components, fabrication, applet, website, and experience are of custom design, using the highest quality materials to ensure maximum performance for the next five years." In the first installation of it's kind on a college campus, Philips has unveiled a large-scale lighting project that leverages a Power over Ethernet (PoE) system combined with LED lighting to improve energy efficiency. The system, installed on Clemson University's South Carolina campus, will deliver up to 70 percent in energy savings. According to Philips, "the customized system will provide flexible work spaces that encourage collaboration between faculty and students, [and] optimize space management in the facility." 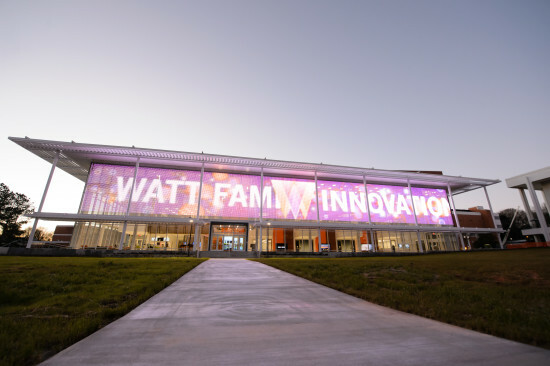 The Watt Family Innovation Center gathers "historical and real-time anonymous data from each lighting fixture to determine when a room is being used." 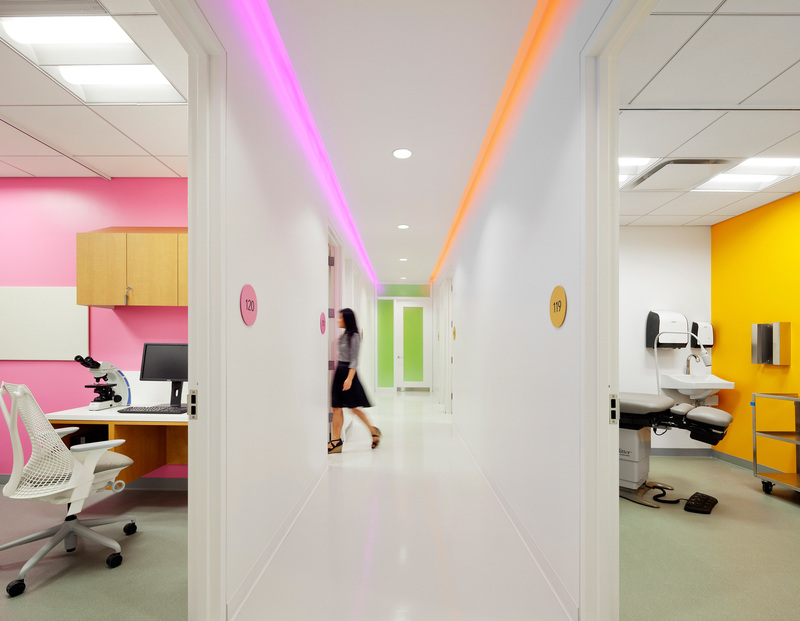 Essentially the lighting is self-monitored, and uses motion-sensors to determine how much activity is happening in a room, and light the space accordingly. Additionally, the system can be controlled entirely from a single software console and allows for remote access via any authorized smartphone or tablet. Additionally, the center also features "the largest media facade installation in the U.S. using Philips iColor Flex LMX gen2, flexible strands of large high-intensity LED nodes with intelligent color light," according to Philips, which can be used to display student news, and large graphics to display school spirit. The installation includes more than 45,000 individually controllable light points. Luminaries Brookfield Place Winter Garden 10:00 a.m.–8:00 p.m. 230 Vesey St., New York Through January 10, 2016 New York–based architecture and design practice Rockwell Group is lighting up New York City this holiday season with Luminaries, an interactive lighting display inside the ten-story, glass-vaulted pavilion Winter Garden Atrium at Brookfield Place New York. 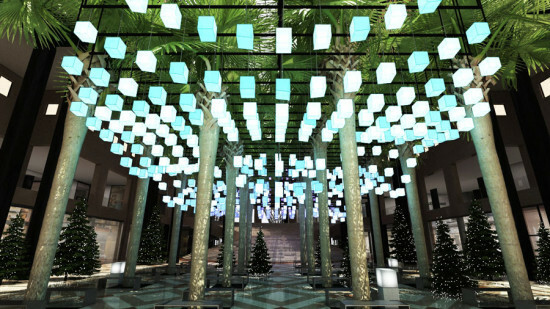 Designed by the LAB at Rockwell Group, the festive display features a large illuminated canopy comprised of 650 lanterns and an array of color-changing LED lights. The display is also outfitted with three interactive “wishing stations,” which trigger various lighting effects upon touch. For every wish made at Luminaries, Arts Brookfield will donate $1 up to $25,000 to the GRAMMY Foundation in an effort to fund music education programs for high school students. Inspired by the holiday traditions of sharing, community, and connection, Luminaires includes five choreographed light shows—Snowfall, Christmas Tree, Ribbons, Firecracker, and Northern Lights—that are scheduled every two hours during exhibition hours. Visit Arts Brookfield's website for more information on the exhibition. 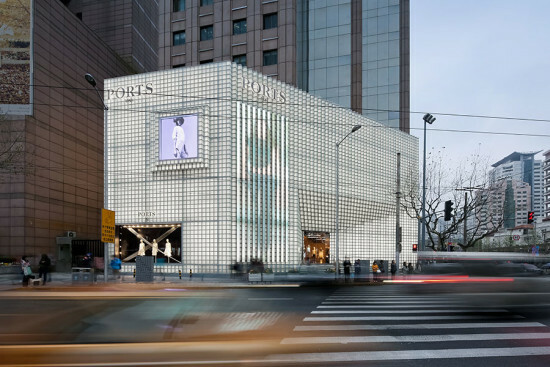 From Functional to Fashionable: glass blocks used to create a glowing facade in Shanghai. Facade Manufacturer J. Gartner & Co. (HK) Ltd. Facade Installer J. Gartner & Co. (HK) Ltd.